We grow MANY different subtle varieties, most with boring technical names, so our peaches are best categorized as white, yellow, and donut. 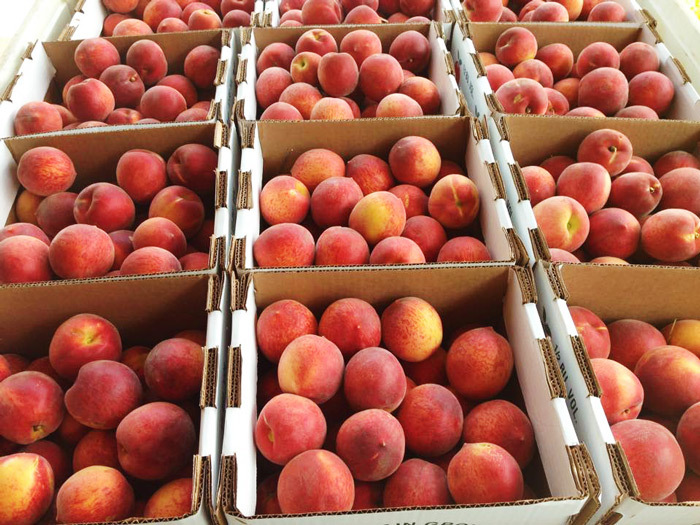 All our peaches are offered ready-picked, or as pick-your-own when in season at Chiles Peach Orchard and Carter Mountain Orchard. Peaches and nectarines are either clingstone (which means the fruit does not come away from the seed easily), semi-clingstone (which means that some of the fruit will come away from the seed), or freestone (which means the seed breaks away easily from the fruit). Generally, the early ripening varieties are clingstone. Many people like to use clingstone peaches for pickling. For canning and freezing, most people prefer freestone fruit, as it is much easier to work with. By late July and into August, all the varieties will be freestone. When selecting peaches, smell the fruit. The peach is a member of the rose family and should have a pleasingly sweet fragrance. Look for a creamy gold to yellow under color. The red or “blush” of a peach is an indication of variety, not ripeness. Peaches should be soft to the touch but not mushy. 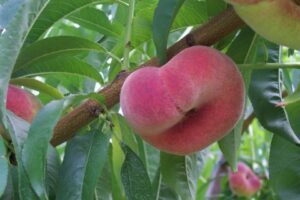 Don’t squeeze peaches; they bruise easily. Place firm peaches on the counter at room temperature and they will soften within a few days. Promptly refrigerate ripe peaches and eat them within a week of purchase. When freezing, peaches should be ripe and soft but not mushy. Wash peaches thoroughly in cold water (ice water is preferable for keeping the fruit firm). Peel and slice a small amount at a time, mixing about 1 teaspoon ascorbic acid (available at grocery and drug stores – is not harmful and will not affect the taste of the fruit) with 1 cup sugar, then sprinkle over sliced peaches. Pack in airtight containers or jars (suitable for freezing), and fill to 3/4 full, then freeze. Peaches contain many important nutrients including: vitamin A, in the form of beta carotene, which has been linked to a reduced risk of some forms of cancer; and riboflavin which is good for the eyes. They are an excellent source of fiber, and peaches are one of the lowest-calorie fruits, with virtually no fat, sodium or cholesterol. To peel a peach, dip it into boiling water for 30 seconds, then in cold water. The peel should slide off easily. To keep sliced peaches from darkening, add lemon juice or ascorbic acid. Peaches contain many important nutrients including: vitamin A, in the form of beta-carotene, which has been linked to a reduced risk of some forms of cancer; and riboflavin which is good for the eyes. They are an excellent source of fiber, and peaches are one of the lowest-calorie fruits, with virtually no fat, sodium or cholesterol. Should I cook with white or yellow peaches? White-fleshed peaches have a very different flavor than a traditional yellow-fleshed peach. They are very sweet, but much more mellow and smooth than the more acidic yellow peach. The flavor is like honey or sugar, very smooth. White peaches can be cooked, canned, or frozen the same way as yellow peaches. Use your favorite in any of your recipes! And how about those donut peaches? Donut peaches are flat and either white or yellow-fleshed. They have a thin skin, a tiny pit, and are super sweet! They are perfectly sized for snacking! What are some good peach snacks? Here are some fresh ideas for enjoying one of nature’s sweetest fruits — the peach. Fresh, out of hand as a sweet snack. Peach halves topped with fresh berries make an easy, yet elegant fruit salad. For a quick low-fat lunch, mix peach slices with low-fat yogurt or cottage cheese. Grilling fresh peach halves with blueberries and brown sugar is a delicious dessert for a picnic or barbecue. Blend peaches into frozen daiquiris, smoothies or shakes to cool down hot summer nights. Top low-fat vanilla frozen yogurt or a slice of angel food cake with fresh peaches for healthy dessert. Bake them into summer´s favorite fruity desserts: cobblers, shortcakes and pies. Add fresh peaches to vanilla ice cream to create one of America´s all-time favorite ice cream flavors. Add peaches to spinach or pasta salads. Garnish desserts, main dishes and summer beverages with peach slices.